Posted by Chalie at Monday, February 06, 2012 . Dear Father, the noise of the world is too great; the demands of the day too high. Things are happening so fast that they are over even before I begin to realize that they have come. I don’t know anymore which of the things I do makes any sense at all. I don’t know anymore where I am going though too often I find myself rushing about so much, afraid that I might be left behind if I care to find a single moment of peace. And yet this time I can no longer drag myself into the chaos where I chose to live. Cup after cup of brewed coffee could no longer give me the energy I need to finish loads and loads of paperwork that lay upon my desk. I pray to you dear Father. I pray for the peace you have promised us, a peace that transcends all understanding, a peace that never shatters with the most troubling shadows of the night. Silence the worries that lurk upon my mind, the fears that have only driven me to burnout and stress. In this moment of prayer, let there be silence. Let there be peace. Free me from my fears and calm my shaking nerves. Let me see clearly that which really matters in life. I offer you everything, that in my nothingness I may find all that I need. Your Presence is all that I need O God, and in your Holy Presence there is peace. Posted by Chalie at Friday, February 03, 2012 . These past few months i was so busy planning for my bunso's 7th birthday. Vince was expecting to have a grand birthday prix on his special day. 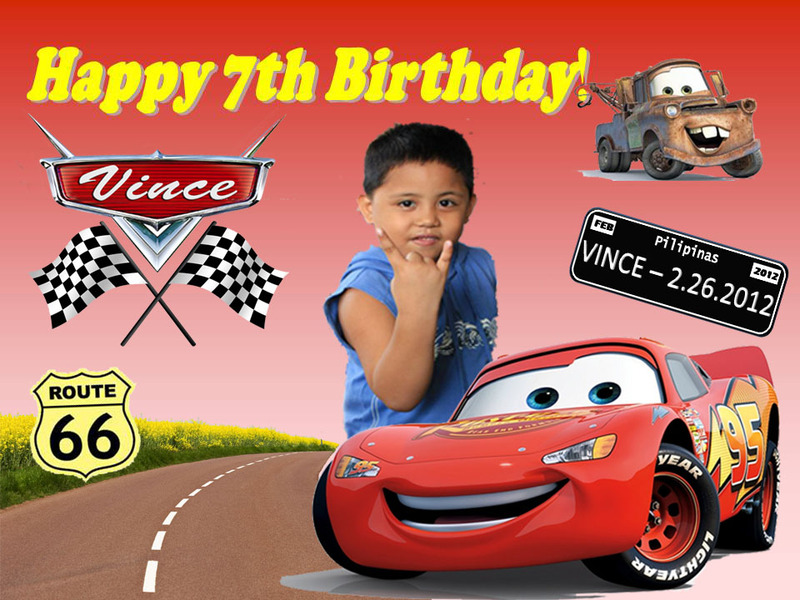 He chose Lightning Mcqueen to be his birthday theme and Jollibee for his venue. We were able to reserved the venue a month earlier just to make sure to get the best deal. I also ordered his customized Lightning McQueen cake plus 50 cupcakes for giveaways. This week am planning to send invites to our relatives and to his closest buddies in our neighborhood. By next week, maybe i'll decide if am going to book for a balloon supplier or i may have it done myself. Whew! 3 more weeks before the big event and i still have tons to do. Oh and i forgot, i need to visit Divisoria for his lootbags. I know, am not the celebrant, but i am so excited for him! I wanted to give him the best party he really deserved! These are the invites and birthday tarp personally designed by my good friend, Roland. He had done several revisions to suit my demands. But after almost two weeks of deliberation, we finally get to see the finished product. And am so happy!!!! A big thanks to you!!! Posted by Chalie at Thursday, February 02, 2012 . Love makes us do things we never thought we were capable of. It's when we love someone so deeply, sometimes we never think of our own happiness. It's when everyday is always a happy day. It's when you love more and expect nothing in return. Being deeply loved by someone gives you strength, and loving someone deeply gives you courage. I was so blessed i have experienced how to love and be loved in return. Even when loving someone means hurting you in the process, but despite of all those pains & struggles you know deep down on you, it's all worth it because you love the person so much you can't live without.